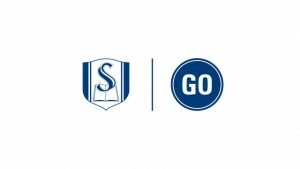 Danny Akin, President of Southeastern Seminary, and J.D. 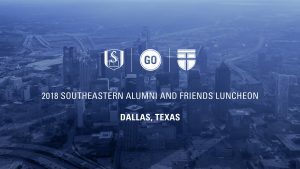 Greear, President-Elect of the Southern Baptist Convention, speak at the 2018 Southeastern Alumni & Friends Luncheon at the Southern Baptist Convention in Dallas, TX. 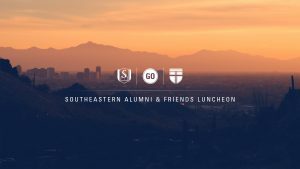 Danny Akin gives his presidential address at the 2017 Southeastern Alumni & Friends Luncheon at the Southern Baptist Convention in Phoenix, AZ. 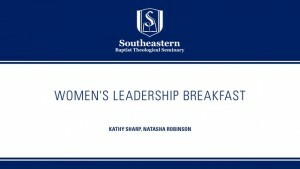 Kathy Sharp, and Natasha Sistrunk Robinson speak at the Southeastern Seminary Women’s Leadership Breakfast at the 2016 Southern Baptist Convention. 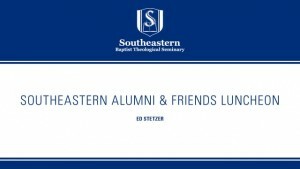 Ed Stetzer speaks on how all of Gods people are on Gods mission at the Southeastern Alumni and Friends Luncheon at the 2015 Southern Baptist Convention. D. A. Horton speaks on Kingdom Diversity at the Southeastern Alumni and Friends Luncheon at the 2015 Southern Baptist Convention. Chuck Quarles speaks at the Southeastern Alumni and Friends Luncheon at the 2015 Southern Baptist Convention.